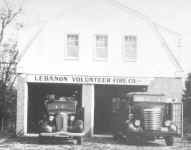 The year 1943 marked a significant date in the history of Lebanon, for during that year the Lebanon Volunteer Fire Department was organized. 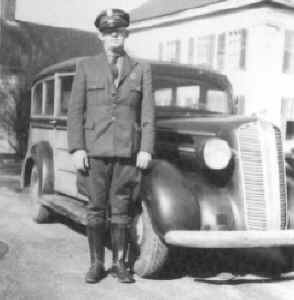 The information for this history was obtained from the company’s written records and the collective memories of the members of the Fire Company and the ladies auxiliary. Prior to 1943 there was no organized fire protection for the town. Through the efforts of C. Huntington Lathrop of the State Forest Commission, and Clark Standish, Forest Ranger, permission was received from the State Park and Forest Commission to use the fire equipment of the Salmon River District, which was housed in Lebanon to provide protection. Many people of the town had long felt the need to have a fire department of their own in town. 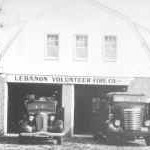 Consequently, in September 1943, the first meeting of the Lebanon Volunteer Fire Department was held in the Lebanon Town Hall with many men signing as charter members at that time. The period for sign-up was extended until January 1, 1944, and as of the closing date, 53 men had signed as charter members. Until the new firehouse was completed, meetings were held in the town hall and in the Lyman Memorial High School Auditorium. In September 1945, the first annual meeting and banquet was held at the Log Cabin Restaurant with 200 present. The ladies of the town served supper. 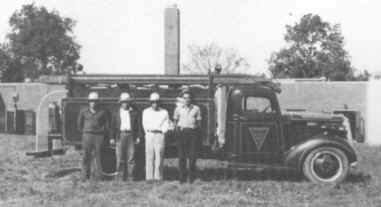 In June 1944, nine months after organizing, the firemen purchased Engine 1, a used 1937 one and one-half ton Chevy chassis. The following month, P.J. Sullivan donated a 600-gallon tank to be put on the chassis. 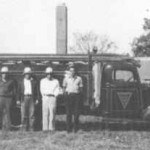 In August 1944, the Department purchased a 150-gallon pump, fittings and 500 feet of one and one-half inch hose. The truck was then equipped with a hose box and storage compartments for other equipment. Adolph German of Columbia and members of the Department did the work. It was with great pride that Engine 1, the first fire truck, was ready for service. The truck was housed first in Bert Sweet’s open garage and later moved to the basement of Bill Pultz’s store for $15.00 a month. Volunteers met on Tuesday night ‘to work on the new truck and to become familiar with the equipment. Drill nights were changed to Sundays during the winter months because of the shorter daylight hours. Members were also busy with fund raising.